How Do I Exercise My Overweight Cat? When you think of a cat, your mind normally goes to a very sinewy, lean, muscled, and fast predator that is very light on their feet, active, and quiet. However, obesity is a big problem with cats because you can’t necessarily get them to exercise like you can a dog. With that in mind, how to exercise your overweight cat once you realize that your cat has a problem? We’re going to put together several excellent things you can try to help your cat lose the excess weight and have a happier, healthier life. If your cat doesn’t have a lot of toys around, you want to add a few to give them plenty of options to grab and run around with. If your cat tends to chew on things, then you might want to try a chew toy. If you don’t have the money to splurge on expensive toys for your cat, they’re usually content with simple things like paper balls, balled up pipe cleaners, or ping pong balls. You can toss these things all over your home and let your cat explore and find them on their own. They’ll get exercise, and you can also make a few hanging toys that encourage your cat to jump around and try to grab it. Your cat has a natural prey drive, and you can stimulate this drive and get your cat to exercise at the same time by hiding small portions of food around the house. Take your cat’s normal meal (dry food is best) and split it into three or four equal portions every day. You can take these portions and hide them in various spots around your house around your cat’s regular mealtimes. Make sure that you space these portions out, and put them in areas where your cat can get to because you want your cat to have fun searching for the food before they find it. 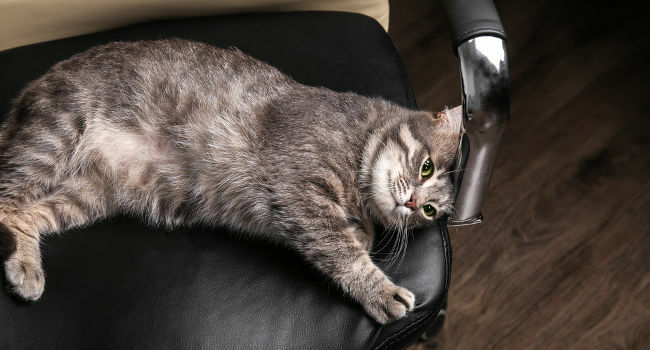 If your cat is very overweight and inactive, you can try to get them going in short bursts three or four times a day before you build up their stamina. You should aim for three to five minutes of activity per play session, and you want to have a structure to this. You could schedule a short play session in the morning hours, again after their midday meal, and two more short bursts in the early evening hours because cats are more active at night. As your cat slims down, you can add more time to their exercise routine. A pair of cats will naturally play more throughout the day than a single cat will, and you may want to consider getting a pair of cats to help keep themselves entertained and slim. It is much easier to get two cats when they’re babies than it is to try and introduce a new cat to your household when they’re older. As a bonus, your cats will also keep each other company during the day or during the evening hours when you’re away from the home. They won’t feel like they’re alone, and this can help to curb any destructive behavior or separation anxiety. A laser pointer is a very inexpensive way to entertain your cat and get them up and bouncing around. However, you also want to have another toy for the end of the laser pointer play session because this toy will give your cat something tangible to grab onto. In turn, this can take any frustration away that they may have at trying and failing to catch your laser pointer’s dot of glowing light. Take it up and down the stairs a few times, through your home, and up vertical surfaces to give your cat a workout. Cats love paper bags, and they like to crawl inside, jump on top of, and crawl under the paper bags until they crush them. You can place several paper bags throughout your house to give your cat several places to explore and play on their own. Boxes are another alternative that you can leave around the house for your cat to play in, and both paper bags and boxes are safe to leave during the day. They may tear the bags, but it won’t hurt them to chew on it or scratch at it when they play. A cat tree gives your cat a vertical space to explore, and they can get a lot of exercise by simply going up and down several times during the day. 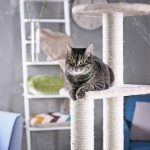 You can buy several different styles of cat trees in different widths, heights, and with varying features like platforms, hammocks, and tunnels. If you don’t have room for a full cat tree, consider getting a vertical cat tree that attaches to your ceiling or wall. They’re great for apartments or small houses where you don’t have the floor space to support a large cat tree. You can train your cat to walk on a leash with a harness just like you can train a dog. Cat harnesses are typically smaller and made of a mesh material that is much softer and more lightweight than a traditional dog harness, but they work the same way as one for your dog does. It may take a few weeks to get your cat used to the harness and leash, and you want to make sure that they’re comfortable with going outside. Even taking them outside for a few minutes every day will start encouraging them to get up and explore. With a little training and supervision, you can train your cat to walk or run on a treadmill or wheel during the day or evening hours. You do want to start at a slow walk and slowly work your cat up to a more brisk pace when they get used to it. Additionally, it may take a while to get your cat comfortable with even being around the treadmill, and you don’t want to force your cat to get on it because this can create fear. Encourage your cat to get on the treadmill with praise and a few treats. You can get a large box or even a bathtub and toss a ball along the edges. As the ball rolls and ricochets off the edges, your cat will chase after it. This can help them get some exercise, and even overweight cats will find it hard to resist as the ball flies around. Once a week or so, get out a little catnip and put it on a floor where your cat can easily get at it. Catnip can stimulate your cat to run around, play, and get a little exercise in. However, catnip can also make some cats aggressive while others don’t respond to it well. With this in mind, it’s good to limit the catnip to once a week at most if your cat responds favorably, and don’t use it before your cat has a stressful event. As your cat starts to lose the weight and slim down, you can create an agility course for them to go through with a small reward at the end. You can include tunnels, things to jump over, things to go under, hoops, interactive toys, platforms, and much more. If you’re not sure how to put one up, you can buy agility courses that you can set up in your house for your cat. You can also do a little research and create a safe course for your cat to play in. We gave you 12 ways how to exercise your overweight cat that work to safely and effectively help them slim down. Not only is this healthier for your cat because it takes the excess stress off of your cat’s joints, but your cat will be healthier throughout their lives. Why Is My Cat Peeing On My Couch? Why Does My Cat Bite My Nose? Can Cats Have Down Syndrome? © 2019 KittyWire. All Rights Reserved.